07 | September | 2015 | NOT IN MY WORLD!!!! Shawnee Anderson couldn’t stop crying. 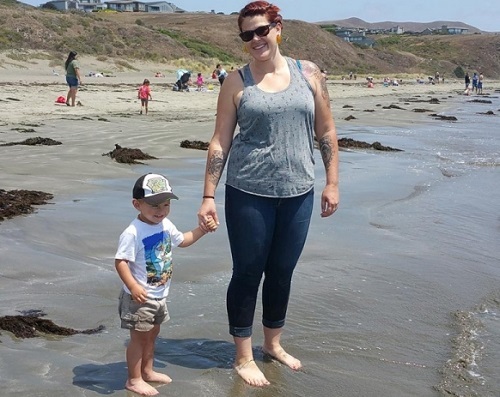 On the morning of Jan. 24 last year, she sat in the front seat of a red minivan parked outside her home in Napa, California, with her 11-month-old son in her lap. Roughly 20 minutes earlier, police had arrived at the one-story house, summoned by a neighbor who’d called to complain about a loud argument between Anderson and her boyfriend, Aaron Hillyer. The couple explained that because they were low on sleep and stressed about Anderson’s first day back at work, a disagreement over who would change their child’s diaper had escalated. “This whole argument is ridiculous,” Anderson told the officers, shaking her head no when they asked if the fight had become physical. But now Hillyer was in handcuffs and police were saying that both he and Anderson would be charged with felony child endangerment. The officers had found prescription marijuana packets, pipes and burnt joints on tables in the living room and the couple’s bedroom. Anderson and Hillyer explained that they were licensed users under California’s 19-year-old medical marijuana law, but the cops said the couple had put their son, Sage, at risk by careless use of the substance at home. “Your baby doesn’t need to be subjected to marijuana,” one of the officers can be seen saying in a video of the incident. The couple spent five days in jail, Sage spent nearly two weeks in foster care, and for the next 13 months Anderson and Hillyer fought a juvenile court’s ruling that they’d mistreated their child. Though they had their son back, the government had official jurisdiction over Sage and was entitled to make any decisions it deemed in the interest of the child, including removing him from his parents’ care. As marijuana laws loosen across the country, there’s a growing gap between what’s legal and what raises red flags for child-protection agencies. Twenty-three states and Washington, DC, have approved medical marijuana programs, and of those, four states and the capital have legalized the drug for recreational use. No nationwide data exist on how many parents have faced neglect and abuse investigations over their marijuana use, as many child-welfare agencies don’t track how many cases involve drugs, much less the type of substance. But the Family Law & Cannabis Alliance, a Massachusetts-based group formed in 2013 to help parents in marijuana-related child-welfare and custody disputes, says it assisted 200 families nationwide last year. Public defenders in Colorado and New York who represent clients in family and juvenile court say as many as one-sixth of their cases involve marijuana, although use of the drug is usually just one of several allegations against parents. Government intervention can result in regular drug testing; findings of neglect, which can impede a parent’s ability to find work around young people; the child’s placement in foster care; and, in rare cases, termination of parental rights. Critics say the approach of child-protection agencies and juvenile courts is often outdated, characterized by overzealous enforcement from the war on drugs era and beliefs about the risks of marijuana that aren’t supported by science. Meanwhile, low-income families of color are more likely to face neglect charges involving pot, as they tend to live in more heavily policed neighborhoods and give birth in hospitals that may be more likely to conduct drug testing on newborns. Officials with state child-protection agencies say that parental marijuana use, whether legal or illegal, would not alone qualify as child abuse or neglect. But they argue that pot use can impair a person’s ability to parent and pose safety risks to a child. Michael Weston, a spokesman for California’s Department of Social Services, declined to comment on specific cases. He said, however, that a caseworker entering a home is looking for all sorts of causes of concern — and that could include bottles of aspirin, of bleach, of illegal drugs or legal marijuana, if they are accessible to children. As states grapple with how to respond to parents’ marijuana use, they are guided by different statutes concerning child neglect and abuse. Under California law, the government must prove actual harm in order to claim custody of a child. But in New York, establishing proof of harm isn’t necessary. In many states, including Colorado, which has allowed the legal sale of recreational pot since last year, a positive test for marijuana in a newborn automatically triggers a child-welfare investigation. And Colorado’s statute specifies that cultivating Schedule I substances — which under federal law includes marijuana, regardless of its classification in individual states — in a home around children also qualifies as child abuse. In some places, child-welfare services are administered at the county level and can take slightly different approaches. Because the definitions of abuse and neglect are fuzzy, lawyers, parents and cannabis advocates say they leave a lot of room for discretion on the part of police, social workers and judges. Some degree of latitude is necessary given the complicated nature of each family’s circumstances, advocates say. But that latitude also means that caseworkers’ and judges’ personal views on marijuana are sometimes reflected in the outcome of cases. Another factor is a family’s ability to afford a lawyer. While most states provide some form of legal assistance for parents ensnared in civil child abuse cases, representation isn’t guaranteed, as it is in criminal cases. Anderson and Hillyer, who are white, were released from jail on Jan. 29, 2014. They were able to scrape together enough money to hire a lawyer, Jennifer Ani; eventually, their legal fees totaled more than $15,000, Anderson says. Ani succeeded in getting the criminal charges dropped. But the couple also faced the case in juvenile dependency court, in which the Napa County child welfare agency alleged that their marijuana use had put Sage at substantial risk of harm. In March 2014, a judge ruled in favor of the agency, but a year later, an appeals court overturned the decision, ruling that the government had erred in taking jurisdiction over Sage. The bills sparked outrage from cannabis advocates and others, who felt the proposals made it easier for caseworkers to justify seizing children from homes where marijuana was present. Jonathan Singer, a state representative and former child-protection officer who opposed the legislation, says he worried it would force workers to take their “eye off the ball” of more serious parenting problems such as domestic violence. Defenders countered that under the proposal, parental marijuana use at home would only be considered child abuse if it posed a safety risk. Both times, the bills failed. Colorado, with its reputation as a mecca for legal pot, has attracted a handful of families fleeing child-protective services in other states. Diane Fornbacher, who says she relocated from New Jersey in 2014 after her son’s mention of hemp in school sparked a brief child-neglect inquiry, says the bills raised the specter of pot-using parents being treated as second-class citizens. Child-welfare cases often begin at the hospital, when pregnant women or their newborns test positive for the substance. Many states mandate or encourage medical workers to report evidence of prenatal exposure to a drug to child-protective services. That’s what happened to Natalia Caustrita, of East Los Angeles. In June of last year, Caustrita, a legal medical-marijuana user, gave birth to a son 11 weeks early. Because he was born prematurely, the boy was tested for drugs. Although Caustrita says she stopped smoking marijuana upon learning of her pregnancy, the child was found to be positive for THC, the main psychoactive ingredient in marijuana. The positive toxicology report triggered a home visit from a worker with the Los Angeles County Department of Children and Family Services, Caustrita says. Caustrita, her fiancé and his parents, who share the couple’s three-bedroom apartment, had to submit to drug testing. The couple prepared a list of people who could take their son if he was temporarily removed from their care. “It was an intrusive, uncomfortable situation,” Caustrita says. Eventually, after hiring a lawyer and appearing twice in juvenile court, the couple agreed to three additional months of regular testing and visits from a caseworker, but their son was allowed to remain in their custody. The entire ordeal lasted 11 months. Lawyers and medical experts are increasingly challenging the wisdom of slapping parents with abuse and neglect charges based on a child’s prenatal exposure to marijuana. While a report by the Colorado Department of Public Health and Environment recently concluded that evidence of the effects of pot use by pregnant women is “mixed,” with “moderate” evidence that the drug is linked to attention problems among offspring, experts including Columbia’s Hart and Carleton University’s Peter Fried have testified that the drug is less harmful to a fetus than cigarette or alcohol use. In New York City, where medical cannabis has been legal for limited use since last year, lawyers say the drug plays a role in perpetuating racial and class disparities in the city’s foster care system. In 2013, 93 percent of the approximately 11,000 foster children in the city were black or Hispanic. The city’s Administration for Children’s Services, or ACS, can refer parents for drug testing even in cases where substance abuse wasn’t among the initial allegations. As social mores and laws on marijuana continue to liberalize, debate on agencies’ approach to the drug is expected to grow. “People are open with investigators about smoking marijuana recreationally because they don’t think the government will take it that seriously — but that’s exactly what ACS does,” says Gabriel Freiman, a supervising attorney with the family defense practice of the Brooklyn Defender Services, which represents many indigent clients in the borough. He mentions a client who, after telling a caseworker she used recreational marijuana, was no longer allowed overnight visits with her son. The child-welfare agency’s approach, he says, is increasingly out of step with the message of New York’s governor and the city’s mayor, who have in the past advocated decriminalizing small amounts of marijuana. Christopher McKniff, a spokesman for ACS, wrote in an email that the agency is very aware of the socioeconomic and racial disparities among children in foster care and is seeking ways to reduce the “disproportionate number of kids of color that become involved in the system.” But, he wrote, parental misuse of marijuana, as with all drugs, can put a child at risk and force the agency to intervene.